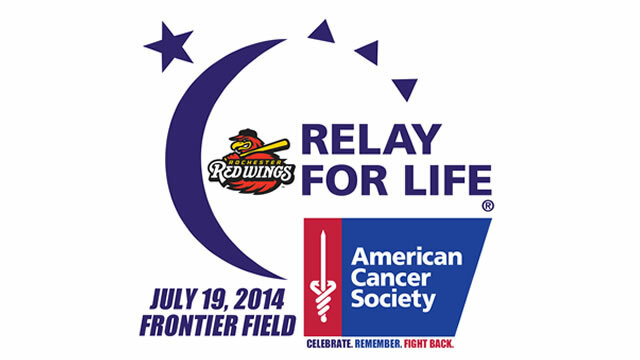 The Rochester Red Wings will host the 2nd annual American Cancer Society Relay For Life event at Frontier Field from Saturday, July 19 to Sunday, July 20. The overnight, community walk around the warning track at Frontier Field will begin with opening ceremonies at 6:00 p.m. on July 19 and conclude the following morning, July 20, with closing ceremonies around 6:00 a.m. In between, participants will take turns walking, running or otherwise circling the track “relay” style to raise funds to fight cancer. In addition, the celebration will include live music, Zumba, a movie, live comedy and food. A Candle Light Luminaria Ceremony will be held at nightfall to honor cancer survivors and caregivers and to remember those lost to cancer. Relay participants can sign up individually or as a member of a team at www.RelayForLife.org/RochesterNY and are encouraged to raise money prior to the event. Last year, over 200 participants helped raise over $30,000 for the American Cancer Society. The ACS’s Relay for Life event ignites team spirit among participants and works to raise funds used to save lives and create more birthdays by helping you stay well, helping you get well, by finding cures, and by fighting back. Since 1985, Relay for Life has spread to more than 5,200 communities in the U.S. and has become a worldwide movement, taking place in more than 25 countries. All fans are encourage to drop off any old pairs of shoes, sandals, ice skates, at the American Cancer Society Relay for Life Table outside the Red Wings Ticket Office on Sunday, June 29 and Saturday, July 5. Fans who drop off shoes will receive $2 off their ticket purchase at the Ticket Office window. The shoe drive proceeds will benefit the Rochester City Relay of the Red Wings. You can register, donate and learn more at www.RelayForLife.org/RochesterNY. You can also contact Red Wings representative Derek Swanson at 454-1001 ext. 3036.